Outdoor ad: AGL Energy: Wheely, Why Not Get a Lift? AGL Energy: Wheely, Why Not Get a Lift? 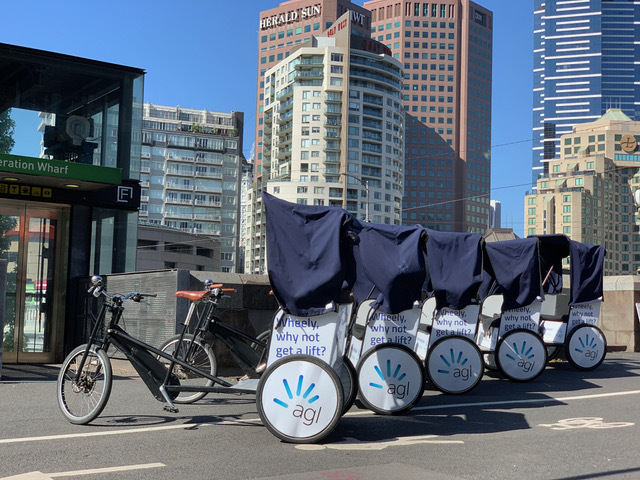 Innovative energy company AGL employs out-of-home marketing agency TMS Outdoor to pedal people from Melbourne’s Federation Square to the Australian Open festival entrance throughout the grand slam. The brand activation will use 21st century bikes to ferry commuters from the CBD to the AO this year, showing visitors from around the world Melbourne’s affection for pedal power. The marketing specialists have also seized the unique off-site opportunity to make the Australian energy company visible outside of the buzzing international sponsorship war inside the tennis grounds. AGL encourages ticket holders to conserve their energy for Melbourne Park and take advantage of the free service while enjoying the picturesque ride along Flinders Walk. The fleet of branded rickshaw bikes will pick-up and drop-off at the top of the River Terrace at Federation Square and AO festival entrance from 10am to 4pm everyday from January 14th to 23rd, and from 2pm to 6pm during January 24th to the 27th.